To retrieve messages from e-mail servers, you can use MailBee.NET IMAP and MailBee.NET POP3 components. Their main classes are Imap and Pop3, respectively. These classes can also be used to manage e-mails and folders, such as delete messages, move them between folders, upload into a folder, search messages for various criteria, manage folders, and so on. Some of this extra functionality is available only with IMAP. E-mail messages can be downloaded completely (with all the text bodies and attachments), header-only, and mixed mode (such as headers and text body but no attachments). Again, only IMAP provides the full set of features. Once the e-mail is downloaded, you can parse it, examine any of its properties, work with attachments, embedded pictures and other linked resources , save it into a file or stream, and process it in any other way. And you can send it again (for instance, create a reply to the message and then send the reply with MailBee.NET SMTP component). The file format of e-mails which is used by SMTP, IMAP and POP3 protocols is called MIME. Therefore, the main class which represents an e-mail message in MailBee.NET is MailBee.Mime.MailMessage. This class can both parse and build e-mails in MIME format. Imap and Pop3 classes return downloaded e-mails as MailMessage objects (for single e-mails) and collections (for ranges of e-mails). Also, IMAP protocol can return some additional information with the message, which is called envelope. Thus, when using Imap class, you'll be mostly dealing with collections of envelopes rather than messages. Of course, an IMAP envelope provides access to the contained e-mail message as well. The POP3 protocol is very simple and provides only basic features of e-mail retrieval. The IMAP protocol (also known as IMAP4) provides much more functions and should be used whenever possible. The only reason to prefer POP3 is if your server simply does not support IMAP (for instance, built-in e-mail server of MS Windows Server 2003/2008). Note that MS Exchange DOES support IMAP (although it can be turned off by default, but the same is true for POP3). Moreover, some popular services like Gmail.com simply do not work with POP3 correctly. E-mail push (instant notification on new e-mail arrival - IDLE) +/? +/- The feature is available with significant limitations. +/? The feature is optional to the protocol implementation. As soon as the e-mail has been downloaded from the server, MailMessage object comes into play and it's no longer important with which protocol the message was retrieved from the server. The capabilities of e-mail parsing and further processing are protocol-independent. Some features require licenses for other components of MailBee.NET family. 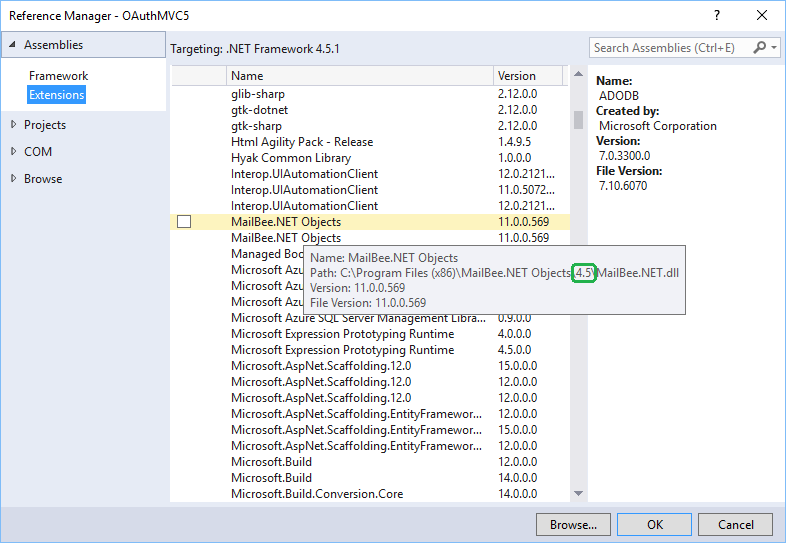 Note that MailBee.NET Objects license includes all individual component licenses. As you can see, all the functions of parsing and processing e-mail are also available if you load e-mail from file or memory (it's not necessary to download e-mail only from IMAP or POP3 server). And you can also load e-mails from XML, System.Net.Mail.MailMessage, Outlook .MSG or .PST file. Create or delete e-mail account. Set auto-responder (vacation message), configure forwarding e-mail to other addresses, etc. IMAP and POP3 protocols are all about managing e-mail in the account but not about managing the account itself. To change e-mail account password or otherwise manage an account, you'll need to check if your e-mail server supports some kind of a proprietary API for this. It can be ActiveX/COM based, REST, specialized network protocol, and so on. For instance, some e-mail servers like Plesk Panel support POPPASSD service running at port 106, which lets you remotely change the password with POP3-alike commands. If NuGet is not an option (for instance, you have older version of Visual Studio), see below. The example below is for Visual Studio 2010, but the idea remains the same for any other version. For instance, Import namespaces and set license key topic of SMTP guide features similar actions in their Visual Studio 2008 version. If Website menu does not appear in the menu bar, you should select your ASP.NET project in Solution Explorer first. This will replace Project menu with Website menu. 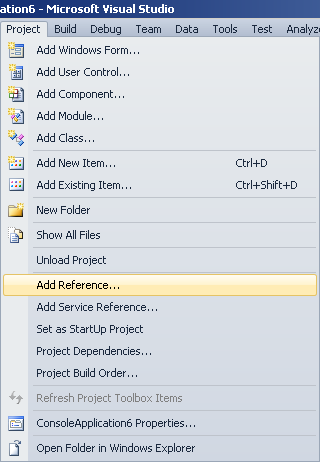 In Visual Studio 2010, Add Reference dialog may look differently for desktop/console and ASP.NET web applications. The below is for desktop/console. The ASP.NET version may look pretty much like in Visual Studio 2008. Click Add Reference and then Close. MailBee.NET entry should appear in References list of your project. Now, import MailBee.NET namespaces to the beginning of your source code files where you'll use MailBee.NET. Now, you need to specify your trial or permanent MailBee.NET license key to unlock the product. If you do not yet have a key, you can generate the trial key with "Get a Trial Key" utility (available in Programs / MailBee.NET Objects menu). You can specify the key in a number of ways (Windows registry, app.config or web.config file, directly in the code). This guide shows two methods of that: hard-coded key and key stored in app.config (web.config for ASP.NET). Using Windows registry is not recommended as your application may be lacking permission to access the required registry branches. If you still need to use the registry (e.g. if your application is distributed with the source code so that you cannot embed the key there), refer to Using License Keys topic in MailBee.NET Objects documentation for details. Before the first use and creating any instances of Imap or Pop3 classes, set the static MailBee.Global.LicenseKey property to assign the license key. It's assumed you've already imported MailBee.ImapMail (or MailBee.Pop3Mail) namespace with using (C#) or Imports (VB) directives. You can also create and unlock instances of Imap and Pop3 classes, passing the license key as a parameter of a constructor, such as Imap(string). Again, it's assumed you've already imported MailBee.ImapMail (or MailBee.Pop3Mail) namespace. Alternatively, you can add app.config to your project (if you do not already have it there) and specify MailBee.NET SMTP license key there. For ASP.NET application, web.config is always available so that you can immediately edit it, but for other application types you may have to add app.config manually. The below we are using Visual Studio 2010. For a Visual Studio 2008 version, refer to a similar topic in SMTP guide. If <appSettings> originally looked as <appSettings/> (self-closing tag syntax), you'll need to unfold it to <appSettings></appSettings> so that you could insert <add key .../> there. The above also applies to ASP.NET application and web.config. You can also specify the key in machine.config file. This will enable access to the license key to all applications on the computer so that there will be no need to specify the license key in each application separately. For instance, this is the preferred way if you a hosting provider willing to let your hosting clients create and run applications which use MailBee.NET without disclosing your license key to them. Imap.QuickDownloadMessage and Pop3.QuickDownloadMessage to download a single e-mail or its header. Imap.QuickDownloadMessages and Pop3.QuickDownloadMessages to download all e-mails in the folder, or their headers. For all the samples in this guide, we assume the license key is already set (such as in app.config file), and these namespaces are imported: MailBee.Mime, and MailBee.ImapMail or MailBee.Pop3Mail. Note that you'll get an exception in case if the Inbox is empty. You may also get an exception if the server requires SSL. See Retrieve e-mail from server which requires SSL (e.g. Gmail) for details. If the Inbox is empty, you'll get an exception. As you can see, this sample can handle the situation when the Inbox is empty. Cannot enable logging to see what's going on and trouble-shoot anything in case of errors. In case if you need to download a single e-mail, you can't learn the number of e-mails in that folder. The only way is to download headers of all e-mails and use the count of items in the returned collection. Cannot download multiple e-mails per connection, cannot delete messages, and so on. The main purpose of the single-line methods is for quick testing during the development process. For instance, if you're developing some sort of e-mail viewer, you can temporarily use a quick method there to have some e-mail to test your e-mail viewer with, without the need of implementing production-level e-mail retrieval code at the moment when you're focused on other tasks. The samples below download the last e-mail in Inbox and save all its attachments into a local folder (skipping linked resources like inline images). The first sample uses "quick" method to download the e-mail while the second sample creates an instance of Imap or Pop3 class. From now on, we'll always create instances of Imap and Pop3 class when accessing e-mail on the server. Also note that we disconnect from the server BEFORE saving attachments. Although it's not required, this lets the application free the connection not waiting until all the attachments get saved (which might take some time). Shortly speaking, just a little optimization here. You can then load this HTML content in any browser control or send it as a response to the client in case of a web application. If embedding into HTML body is not an option for you, you can also store embedded images on the filesystem of the server using MailMessage.GetHtmlAndSaveRelatedFiles method or on an external storage (e.g. Amazon S3 or whatever) using MailMessage.GetHtmlAndRelatedFilesInMemory method. If you need to correcty display e-mail addresses with non-Latin domain names (they are usually encoded in Punycode), you can decode them in human-readable form with EmailAddress.FromIdnAddress, EmailAddressCollection.FromIdnAddress or EmailAddress.UnescapeIdnDomain methods. It's safe to use these methods even if the address is not encoded (the methods will return the same value as on input). The lack of folders except of Inbox in POP3. The ability to specify message index as UID in IMAP (not used in this sample, though). Add Imap.SelectFolder("Inbox") after calling Imap.Connect(serverName). Set indexIsUid to false when replacing Pop3.DownloadEntireMessage(index) with Imap.DownloadEntireMessage(index, indexIsUid). Set indexIsUid to false when replacing Pop3.DownloadMessageHeader(index) with Imap.DownloadMessageHeader(index, indexIsUid). Call Imap.Close() to purge the deleted messages (if you deleted some messages during the current session). Given the above and for brevity's sake, many samples in this tutorial feature only POP3 or IMAP support, with the appropriate comments in protocol-specific portions. The samples which are completely specific to IMAP or POP3 are accompanied with a special note. In POP3, it's two numeric parameters: the first index and the count of e-mails to be affected. Example: 11, 20. In IMAP, it's a string parameter consisting of the first and the last indices separated with a colon. Example: 11:30. Operations other than downloading e-mail (such as search for new e-mails), can be very different between POP3 and IMAP (and even not always possible with POP3 at all). Because ranges are set differently in POP3 and IMAP, two different samples in this topic. // If the inbox contains less than 10 e-mails, adjust to that. // As e-mail indices on the server start with 1 (not 0), must add 1.
' If the inbox contains less than 10 e-mails, adjust to that.
' As e-mail indices on the server start with 1 (not 0), must add 1. Actually, IMAP ranges are much more powerful, they are rather sets than ranges. For instance, you can list multiple individual messages or ranges in a single set, separating them with commas. Example: 5,17,24:30,45:60,122. You can also use the IMAP syntax like 10:*. It means "select all e-mails from 10th to the last e-mail in the folder". Let's assume we need to completely download all new e-mails and display the attachment count for every downloaded message. The sample above uses Unique-IDs (UIDs) instead of ordinal message numbers but it would work with message numbers too provided that nobody access the same mailbox simultaneously. Also note that all the e-mails found are then downloaded with a single command. This may or may not be acceptable in your case. This is fast but may consume too much memory if there are many new e-mails are they are big. Usually, downloading multiple e-mails in a single command makes sense when you download just message headers (because they are quite small). With POP3, the server knows nothing about new e-mails and you'll need to find out which e-mails are new by yourself. Even with IMAP, you may also need to implement search for new e-mails manually in case if your idea of which e-mails are new is different from what your server thinks on the same matters. For the server, the e-mail is no longer new if anyone has already selected the folder which contains this e-mail (even if this person never downloaded the e-mail). If you need to detect not the e-mails which just arrived but all the e-mails you have never seen (and never downloaded), use UNSEEN search flag instead of NEW. Imap.DeleteMessages, Pop3.DeleteMessage, Pop3.DeleteMessages methods mark e-mails for deletion. However, none of these methods actually delete e-mails from the mailbox. To purge e-mails marked as deleted, you should properly close the POP3 session with Pop3.Disconnect or close the IMAP folder with Imap.Close. However, there can be exceptions from this rule (Gmail is an example). Note that some servers may, for instance, not let you delete e-mail via POP3 or may simply ignore the deletion request. The typical example of a non-standard POP3 and IMAP behaviour is Gmail. See Gmail IMAP and POP3 issues topic for details. You can also upload e-mails you just sent with SMTP, get the UID assigned to the uploaded e-mail, set flags and date, and so on. Just supply the folder name in Imap.SelectFolder call (or Imap.ExamineFolder for read-only access to the folder). For Gmail.com, Outlook.com and some other popular services MailBee.NET detects SSL settings automatically. For instance. just specify the host name as imap.gmail.com for IMAP or pop.gmail.com for POP3. It also works with Live.com, Outlook.com, Hotmail.com. At the moment of writing, the host names to specify are imap-mail.outlook.com and pop-mail.outlook.com for all these domains. For other IMAP-over-SSL and POP3-over-SSL services, you'll need to set the SSL port explicitly. By default, MailBee.NET uses the most secure SSL protocol supported by the server (usually, TLS). This is controlled by Imap.SslProtocol and Pop3.SslProtocol properties. You can also enable STARTTLS mode to use SSL over regular 143 or 110 port by any of these methods: - Set Imap.SslMode or Pop3.SslMode property to SslStartupMode.UseStartTls value BEFORE connecting to the server. - Or, call Imap.StartTls/Pop3.StartTls AFTER connecting to the server. 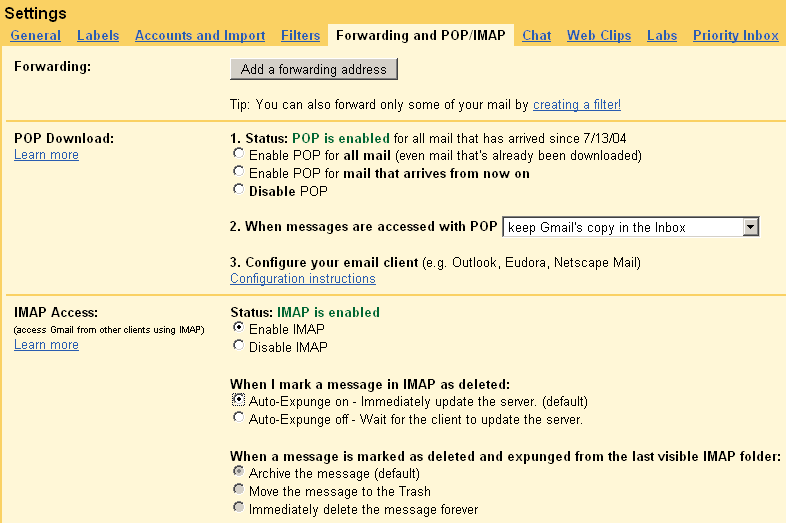 Gmail.com, being mostly a web-based e-mail service, provides quite a special implementation of IMAP and POP3 protocols. This topic describes some issues that you should know about. Only POP3-over-SSL is supported (at port 995). The standard port 110 is not available. By default, MailBee.NET automatically enables SSL and sets port 995 in case if the host name is pop.gmail.com. Make sure to enable POP if you need POP3 access. In most cases, it makes sense to select all mail option. Gmail does not allow the client to delete e-mail from the mailbox. Delete commands are simply ignored. You can, however, change When messages are accessed with POP setting to automatically delete or archive the e-mails you downloaded. This way Pop3.DownloadEntireMessage will also have effect of Pop3.DeleteMessage. Only IMAP-over-SSL is supported (at port 993). The standard port 143 is not available. By default, MailBee.NET automatically enables SSL and sets port 993 in case if the host name is imap.gmail.com. Make sure to enable IMAP if you need IMAP access. When the client sets \Deleted flag for some e-mails (such as with Imap.DeleteMessages method), Gmail by default actually deletes these e-mails, not just marks them as deleted. To change this, set Auto-Expunge to off. Gmail may return localized name for Inbox folder which you cannot use for selecting this folder. You must always pass INBOX to select an inbox. To find out if certain folder is inbox you can check its FolderFlags value. You can use international text in search criteria only in the form of an IMAP literal. Quoted text can be used only with ASCII while literals can also be used with UTF-8 and so on. See the code snippet below (imp is Imap instance). If you experience Web login required error in Gmail IMAP or POP3, open https://www.google.com/accounts/DisplayUnlockCaptcha page in the browser and confirm your identity to Google. After that, IMAP and POP3 access should be working again. If you need to disable the auto-detection of Gmail SSL settings, set MailBee.Global.AutodetectPortAndSslMode to false. This topic is mainly for MS Exchange 2007-2016 and Office 365 (which is powered by MS Exchange 2016). For MS Exchange 2003, many of the issues described below do not apply. Sadly, IMAP and POP3 support in MS Exchange has degraded in newer versions. The major specifics of MS Exchange POP3 and IMAP access is that MS Exchange mostly targets Outlook clients which work with MS Exchange via MAPI, not POP3 or IMAP. Therefore, neither IMAP nor POP3 is even enabled in MS Exchange by default. Make sure the service required for your application is running. IMAP/POP access can also be blocked on a user level. Make sure the e-mail account you're using has IMAP/POP access enabled. However, Administrator user cannot have IMAP/POP access enabled under any circumstances. You'll need to connect via SSL or use secure authentication. MS Exchange 2010 supports only GSSAPI which is, however, supported by MailBee.NET either. Feature set of MS Exchange is also more limited than in most other IMAP servers. For instance, you cannot use search with international charsets (such as UTF-8). Only ASCII is supported. You may consider switching to EWS (Exchange Web Services) when working with MS Exchange or Office 365 server. See Ews topic for examples. You can enable logging of IMAP or POP3 conversation between MailBee.NET client and the server in a number of ways. You can use logging into a file or memory, subscribe to Imap.LogNewEntry or Pop3.LogNewEntry event which raises each time a new log record is about to be created, and much more. The license key is not set correctly. See Import namespaces and set license key topic. 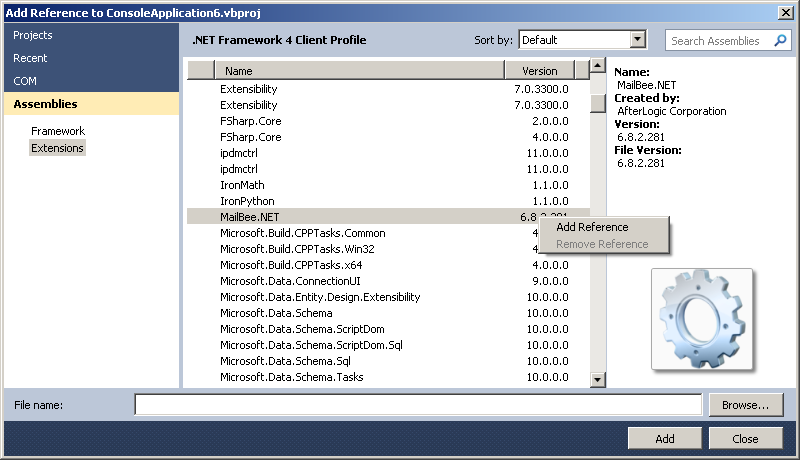 ASP.NET virtual directory is not configured as an application in IIS. 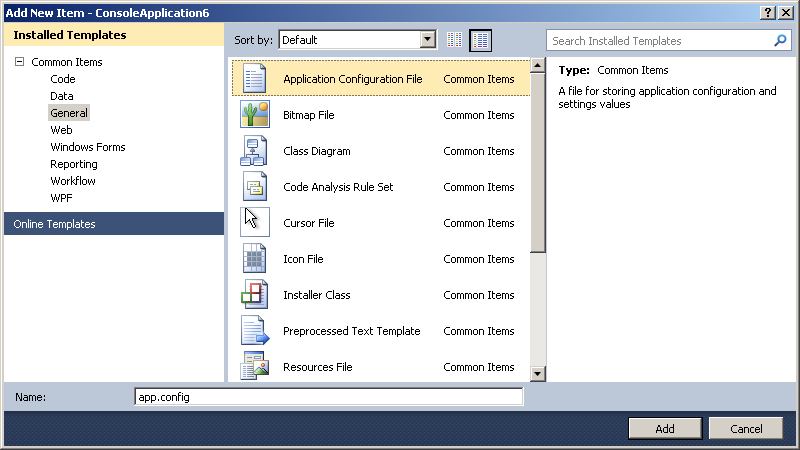 In IIS Manager, enable Application for the given web site or virtual directory. ASP.NET v2.0 or v4.0 is disabled (although it may be installed). In IIS Manager for the given web site of virtual directory, check that ASP.NET version being used is 2.0 or higher (4.0 or higher is you're using .NET 4.5 optimized version, MailBee.NET.45.dll). Make sure MailBee.NET.dll actually exists in /bin folder and the application does have permission to read this file. IMAP port 143 or POP3 port 110 blocked, open it (may not be possible if the port is blocked by your ISP). Your server requires SSL connection, use dedicated SSL port 993/995 (IMAP/POP3) or use STARTTLS over regular port 143/110. See Retrieve e-mail from server which requires SSL (e.g. Gmail) topic for details. You're trying to connect to SSL port as if it were a regular port, or vice versa. See above on how to correctly connect to a dedicated SSL port or to a regular port in STARTTLS mode. Authentication failed due to incorrect username or password. The server may expect username as "account@domain" while you supplied just "account", or vice versa. Secure authentication failed due to errors in its implementation on the server. Web login required error indicates the user must log in via web interface of the mail service first (e.g. via Gmail web site). You can read more in Gmail IMAP and POP3 issues topic. MS Exchange specific issue. See MS Exchange IMAP and POP3 issues topic for further suggestions. Check if you can retrieve e-mail with another IMAP or POP3 client which is installed on the same computer as MailBee.NET. Another IMAP or POP3 client should use exactly the same settings like ports, SSL mode, authentication, etc. Note that MS Outlook is not an IMAP or POP3 client because it usually works via MAPI rather than IMAP or POP3. Mozilla Thunderbird is, however, an IMAP and POP3 client. Can't see any e-mails in the mailbox while can see them with a web interface (usually, with Gmail). Check the account settings. It may be configured to behave differently for the web interface and IMAP or POP3. Read more at Gmail IMAP and POP3 issues topic. Do not receive all e-mails at once. Instead, receive large e-mails one-by-one or at least in portions (e.g. 10 e-mails per command), then process the current portion and discard it before retrieving another portion. MailBee.NET does not use temp files during e-mail retrieval so that any e-mail you download will consume memory until freed. Can't save attachments or linked resources. There can be a permission problem (typical for web applications, or if you write into the root folder like *C:* which is not usually allowed in modern Windows versions). As a general suggestion, read carefully the exception message as it may already provide some useful information, and always enable logging when you face any connectivity errors. The log file is a very helpful source of the debug information which you can use to understand and fix the issue or send it to AfterLogic Support Team for further analysis. To learn how to enable logging, see Log file of IMAP and POP3 session topic. To submit the log file to AfterLogic, create a ticket at http://helpdesk.afterlogic.com and upload the file there. In case if certain e-mail cannot be parsed properly, you can save it as .EML file using MailMessage.SaveMessage method, and then open it in Mozilla Thunderbird. Does it look correctly there? If it's displayed OK, you can then submit it to AfterLogic as described above.